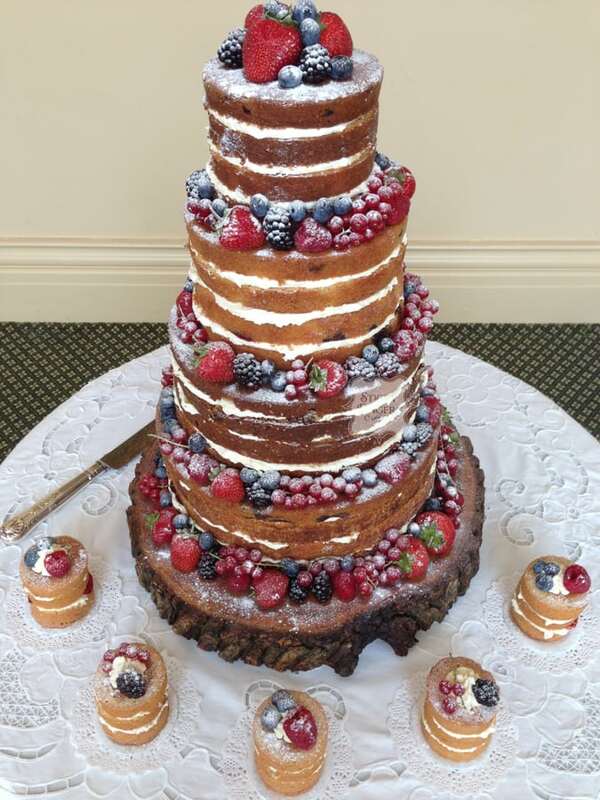 It was my absolute pleasure to deliver this 4 tier naked wedding cake to The Lawn, Rochford on Sunday 30th August for the wedding of Lorraine and Aaron, who have to be the coolest couple I’ve met and such a pleasure to work with. The flavours they chose were different to what I would normally bake (think muffin flavours!) and were alternate tiers of Lemon and Blueberry and Orange and Cranberry. I was really chuffed on how they turned out and have to say that my kitchen smelt amazing as they were baking! I decorated the cakes with fresh berries and a dusting of icing sugar. They also wanted 5 mini Victoria Sponges, which I placed around the bottom of the cake. Massive congratulations to you both and I hope you have a long and happy life together.